520a, Hubcap used, 14", 97-99, DODGE, NEON, SILVER W/BLACK LUGS, 8 LARGE HOLES, 5 BLACK LUG NUT CAPS, 4 ANTI RATTLE PINS, HELD ON BY LUG CAPS. 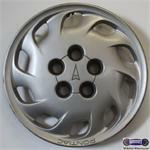 55064, Hubcap used, 15", 05-06, Honda, Accord, SILVER, 6 spoke, ENGRAVED LOGO, HELD ON BY LUG NUTS, 6 ANTI RATTLING CLIPS. 6000a, Hubcap used, 14", 91-95, Saturn, S series, 7 SLOT TYPE, LUG NUT RETAINING CAPS, ALL SILVER PAINTED, 7 ANTI-RATTLE CLIPS, HELD ON BY LUG CAPS. 6007, HUBCAP USED, 15", 96-97, SATURN, S SERIES, SPARKLE SILVER, 8 SPOKE TYPE, 4 BLACK LUG NUT RETAINING CAP, ANTI-RATTLE CLIPS. 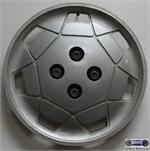 6007, HUBCAP USED, 15", 96-97, SATURN, S SERIES, SPARKLE SILVER, 8 SPOKE TYPE, 4 BLACK LUG NUT RETAINING CAP, ANTI-CLIPS. 6009, Hubcap used, 15", 97-98, SATURN, S SERIES, SPARKLE SILVER PAINTED, 6 SPOKE, 4 LUG NUT CAPS, ANTI-RATTLE PINS, HELD ON BY LUG CAPS. 6011,15" USED HUBCAPS, '99-'02, SATURN, S, SPARKLE SILVER, 4 BLACK PLASTIC LUG NUTS, 8 OPENINGS, HELD ON BY LUG NUT CAPS, 4 ANTI-RATTLING CLIPS. 6011, 15" USED HUBCAPS, 99-02, SATURN, S, SPARKLE SILVER, WITH 4 BLACK PLASTIC LUG NUT 8 OPENINGS. HELD ON BY LUG NUT CAPS, 4 ANTI-RATTLING CLIPS.